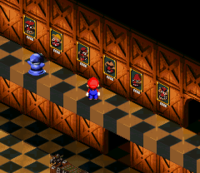 This article is about the character that appears in Super Mario RPG: Legend of the Seven Stars. For the item from Mario Party: Island Tour, see Booster (item). "This is like realizing you're outside without your clothes on!" Booster is a character from Super Mario RPG: Legend of the Seven Stars who lives in Booster Tower with three Snifits. He is of the seventh and current generation of Boosters. Despite his wealth, Booster would rather have fun and spend his days playing with his Snifits and others he invites to his tower. When Exor crashed into Bowser's Keep, Mario, Bowser and Princess Toadstool went flying in opposite directions. While Mario landed safely at his house, Toadstool, unfortunately, landed at Booster's Tower. Of course, Booster's reaction to this strange event was even stranger; Booster decided he must marry this woman who fell from the sky. Booster locked Toadstool on the balcony of his tower, waiting until the time was right to marry her, despite her constant cries of "MARIO, HELP ME!" When Mario arrived at the tower, Booster thought he just wanted to have fun. Oblivious to who Mario was, Booster determined the mustachioed hero before him was none other than the "Mario" Toadstool had been screaming about. Booster attempted to eliminate Mario with some Bob-ombs, but Mario escaped the deadly blasts. Upon reaching the top of Booster's tower, Mario is forced to hide behind the curtains and play a game of hide-and-seek with Booster and his Snifits; depending on how well Mario does, one of two things happen. If Mario can avoid getting caught until the very end, Booster ignores him and finds his Mario Doll, only to find he cannot reach it; Mario promptly jumps to retrieve it for him, and, out of gratitude, Booster gives him the Amulet. If Mario loses the minigame, he and his allies are forced to fight Booster. Booster starts the battle accompanied by his three Snifits, but he cannot be attacked and does not act, at least at first. Once the Snifits are defeated, Booster becomes vulnerable and begins the fight proper. Booster either attacks or throw a bomb at one character, the latter of which hits with 1.5x the power of his normal attack, until his HP is reduced to 500. When this happens, Booster incorporates two new attacks to his arsenal: the first is Spritz Bomb, which hits one character for 2x the power of his normal attack. The second - and far more dangerous - attack is one exclusive to him called Loco Express. Loco Express hits one character for 4x the power of his normal attack, a blow that could instantly KO Mario or his allies through sheer damage unless they are severely overleveled. There are no real tricks to this battle; Booster simply hits incredibly hard. It is recommended for the player to win the minigame; while Booster is far from unbeatable, and gives some EXP and a whopping 100 coins, the Flower Box is not a guaranteed prize, and it is possible to reach the max FP cap of 99 without it. The Amulet is a strong accessory anyone can use, raising all stats by 7 as well as reducing damage from elemental attacks, and the game of hide-and-seek is the only opportunity Mario has to obtain it. Regardless, Booster flees the tower, taking Toadstool with him. Mario gives chase, however, he has to battle Booster's clown minions, Grate Guy and Knife Guy. After dispatching the duo, Mario chases Booster up Booster Hill to Marrymore, the marriage resort where Booster plans to marry Toadstool. Mario crashes the wedding. In the end, Booster ends up helping Mario and his friends by eating a monstrous wedding cake that prevented the team from leaving the wedding chapel. After the Marrymore incident, Booster and his Snifits returned to Booster Tower to resume their games and fun. If Mario returns to the balcony on Booster's Tower after the events of Marrymore, Booster can be seen on his tower balcony with his Snifits. He is staring at the sky, thinking another potential wife may eventually fall down to him. Later, if Mario returns after the events of Nimbus Land, a second woman fell from the sky and landed at Booster's Tower, Valentina, with her bumbling assistant Dodo. Valentina at first rejects Booster, but Booster whispers something unknown into her ear that has the profound effect of winning her over. The two villains soon fall in love and eventually go to Marrymore to get married, with Dodo presiding over the wedding, as seen in ending. However, Booster seems to get cold feet with Valentina constantly getting closer to him, and he flees the wedding. While Mario is in Marrymore, he actually may get a kiss from the bearded Booster, depending on how fast the plumber retrieves Toadstool's accessories. This happens if Mario takes a long time recovering the items. Other variations of the cutscene include Toadstool kissing Mario, Bowser kissing Mario and Booster kissing Bowser. Booster appears with everyone else at the parade in the game's ending. He is riding a train following Valentina and Dodo. At a point, the Snifits run past with bags and Booster jumps out and follows them. The four are later seen fleeing from Croco and a Crook with the pair's loot. For some reason, Booster is in the Koopa Clown Car and Bowser is chasing him. Booster is a bit crazy and relies on his Snifits to do all his work and explain things to him. The only time Booster wants to fight Mario is when his Snifits find him behind the curtains (when unsuccessfully hiding from them). Though even then Booster believes that it is the Mario Doll that he is fighting and not the real Mario. Booster tends to be either ignorant or even naïve at the time, even not recognizing when Toadstool is crying. Booster bears a striking resemblance to both Wario and Final Fantasy IV's Cid Pollendina, having a face, bared teeth, and nose similar to Wario's and a similar nose, bared teeth, straggly beard, and horned helmet as Cid in his original artwork by Yoshitaka Amano. Booster is possibly inspired by Kubla Kraus from the 1979 film, Jack Frost. In addition to their similar appearances, both Booster and Kubla Kraus live in large fortresses, are surrounded by portraits resembling them in different outfits, and hold a female character captive with the goal of convincing her to marry him. Booster is in the Booster the Sixth portrait when he relinquishes the Elder Key. According to the Dr. Topper quiz, he is 7th generation. After defeating Booster or winning the minigame, the password he uses to open the balcony door is the player's name.